The first candidate, Mark Titzer, will interview on campus March 6-7. A reception for the campus community will be held on Monday, March 6, 4:00-5:15 p.m. in Dunigan Lounge (Room 160), Schroeder School of Business Building. Both the Men’s and Women’s Golf teams at the University of Evansville are set to begin play in the spring this week as each will play two tournaments in Florida. Action for both begins today with the Don Benbow Invitational, which will be held at Jacksonville Beach Golf Club in Jacksonville, Florida. It will take place today and Tuesday. On Wednesday, it will be right back to the course for UE as they take part in the Bulldog Invitational at Windsor Park Golf Club, which is also in Jacksonville. Both events are being hosted by Butler University. Tyler Gray had the low average of the fall for UE as he finished with a 71.64. He was the medalist at the Butler Fall Invitational while leading the team to a second place finish. Gray also tied for fourth place at the Donald Ross Intercollegiate. Just behind him was Wil Pahud, who finished the fall averaging 72.79 strokes per round. Kayla Katterhenry won two events in the fall as she had the low mark for the ladies at 75.00 strokes per round. She took top honors in the season-opening Redbird Invitational and also was victorious at the Charles Braun Intercollegiate in October. It was her second-consecutive victory in each tournament. Maggie Camp was next for UE in the fall, posting a mark of 81.31 while Madison Chaney finished with an 81.85. The work of sculptor Chet Geiselman is on display in an exhibit at the Krannert Gallery in the Krannert Hall of Fine Arts until March 28. A reception will be held for Geiselman at 6:30 p.m. on March 16. Geiselman earned a BS in Art from the University of Southern Indiana and an MFA in metalsmithing from Southern Illinois University at Carbondale. He creates works that combine the familiar materials of wood and steel with re-contextualized found objects. In his works, the interplay of form and content generates a tension that is meditative, awkward, humorous, playful, and ultimately open-ended. Geiselman grew up in a small German farming community in southern Indiana. His grandfather was a blacksmith, and his father and uncle were welders. Chet learned to weld and build things with his hands at a very early age. Geiselman has taught sculpture and metalsmithing at several colleges and universities over the years. He has shown his sculptures both nationally and internationally including six one-person exhibitions at Vale Craft Gallery in Chicago as well as numerous juried exhibitions. Currently Geiselman is the 3D studio manager and instructor of art – 3D foundations at Ball State University. Freshman Diana Tkachenko was victorious in singles and doubles once again as the University of Evansville Women’s Tennis team fell to the University of Cincinnati by a 6-1 final on Friday at the Western Tennis & Fitness Club. "We played good tennis again today unfortunately just didn't get the results we're looking for,” head coach Jayson Wiseman said. “As a coach I have to do a better job of getting them prepared for the level competition that we are playing and hopefully we will do a better job this week of converting hard work into positive results for our spring break matches." Tkachenko had another great day for UE as she topped Kelly Poggensee-Wei at #2 singles, 6-1, 4-6, 1-0 (10-5). She also teamed up with Nicoli Pereira to defeat Harley Hutchison and Ali Miller in #2 doubles, 4-3. Daria Pentsova and Andrea Pascual-Larrinaga put up nice fights at #4 and 5 singles, respectively. Pentsova fell to Caroline Morton, 6-2, 6-3 while Pascual-Larrinaga lost in fifth-flight singles, 6-3, 6-3. Over the next few days, the Aces will play six matches in Orlando, Florida. Facing the top seed of Arch Madness in Illinois State, the University of Evansville Men’s Basketball team battled to the finish but came up just short in an 80-69 game on Friday at the Scottrade Center. Evansville (16-17, 6-12 MVC) cut what was a 14-point Redbird (26-5, 17-1 MVC) lead to just four in the final minute, but some late free throws clinched the game. Jaylon Brown was the leader once again for UE, recording 24 points. It marked his sixth game in a row with 20 or more points. David Howard totaled 14 points and seven rebounds while Christian Benzon had another stellar game. Benzon notched the first double-double of his career, posting 11 points and 10 rebounds. Ryan Taylor notched 10 points. ISU had four double-figure scorers led by Deontae Hawkins, who had 19. Keyshawn Evans had 16 while Paris Lee and DJ Clayton notched 13 and 12, respectively. Taylor recorded the opening five points of the game for UE as they jumped out to a 9-4 edge. The Aces continued to hold that advantage over the opening 10 minutes of the game as a Jaylon Brown free throw gave UE a 17-12 advantage. That is when Illinois State made its run. A triple by Keyshawn Evans with 8:35 left in the half gave ISU a 20-19 lead. After Evansville tied it up at 20-20, the Redbirds reeled off eight in a row to go up 28-20 and took their largest lead of 10 points in the final minute as they went into halftime up 43-33. The Redbirds finished the half on a 31-16 run to open up the double figure lead. ISU added to the lead in the first five minutes of the final stanza as they took a 51-37 advantage before two buckets by Sergej Vucetic saw the Aces register eight out of nine points to get within seven at 52-45. The Redbirds were able to extend the lead back up to 11 points with 4 minutes left, but the Aces kept fighting. With 1:07 on the clock, a Brown layup got UE within six once again at 73-67. After forcing a steal on the inbound, Christian Benzon hit a layup as the gap was cut to four just 15 seconds later. That was as close as the Aces got as the Redbirds regrouped to finish with the 11-point win. UE outrebounded ISU by a 37-29 tally, but it was the Redbirds who shot 50.9% while the defense held UE to 42.2%. The UE Bookstore will have revised hours for spring break, March 4-11. The bookstore will be closed on Saturdays. The hours on Monday-Thursday will be 8:00 a.m.-5:00 p.m., and on Friday from 8:00 a.m.-4:30 p.m. Normal hours resume March 13. After a furious rally saw Northwestern State overcome a 6-run deficit to tie it up in the top of the seventh, Brittany Hay came through in the bottom, hitting a walk-off home run to give the University of Evansville Softball team an 8-7 win over the Demons on Sunday. Hay went 2-3 with two runs scored and the homer in the game. Catcher Hayli Scott also had a pair of hits as the Purple Aces (5-9) outhit NSU, 10-9. Emily Lockhart made the start, going 5 1/3 while Ashleigh Downing (1.0) and Samantha Fleming (2/3) finished up the contest. Fleming was credited with the win. Evansville got off to a nice start, scoring a run in each of the first four innings. Mackenzie Johnson opened the scoring with an RBI single in the first. Two more runs crossed the plate in the second as Chandra Parr and Morgan Florey each had RBI knocks. After a pair of unearned runs scored for the Aces in the third, Susan Norris continued the offensive onslaught with a 2-RBI double in the fourth. Just when it looked like the Aces would run away with the win, Northwestern State saw five runs scored in the sixth before tying it up in the top of the seventh. Brittany Hay and the Aces did not let the adversity impact them as she led off the seventh with the walk-off shot. The Aces remain in the state of Oklahoma until Tuesday when the face Oklahoma State at 5:30 p.m. This picture was laying on my work bag when I woke up yesterday for work. Levi's twin sister, Allysa, genuinely thanks everyone for their prayers and blessings. 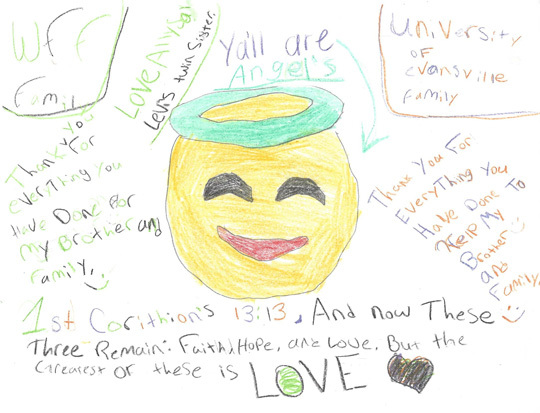 She created this picture to show her gratitude towards our UE and WFF family. I want to share this to give everyone a glimpse of the impact that my work family has had on my immediate family. Including Levi's 9 year twin sister, my youngest daughter. I would like to thank everyone as well. I do not have words to express how full my heart is. Levi is on the long road to normalcy, and I have all the faith in the world that he will make a full recovery, except the scars.